Vizquel’s last at-bat in Sunday’s final game was a satisfying slap hit, raising his career total to 2,657. The rennaissance man and well-known dandy — who also dances, sings, and paints — broke the record this year for most games ever played at the shortstop position, finishing with 2,680. The Giants are transitioning to a more youthful team, moving from 2006, when they had the oldest lineup in the league, to this year when they had 18 rookies make their major league debut with the team, including 23-year-old Emmanuel Burriss, who is slated to take over Vizquel’s position. Vizquel will be fondly remembered by Giants fans, who gave him a long standing ovation and curtain call Sunday when he was removed from the game after taking the field in the top of the fifth inning. He is even more revered in Cleveland, where he played eleven seasons, leading the Indians to a World Series championship. When the Giants played the Indians there this year, it was Vizquel’s first return in another uniform, and he was given a highlight tribute and several long ovations. Vizquel has said he wants to continue playing — if not in the U.S. next year, perhaps in Japan. Well, the 44th annual Big Book Sale hosted by the Friends of the Public Library started yesterday, but have no fear — the sale will continue today and tomorrow from 10 to 8, and on Sunday from 10 to 6. All books on Sunday will be priced down to $1 or less! 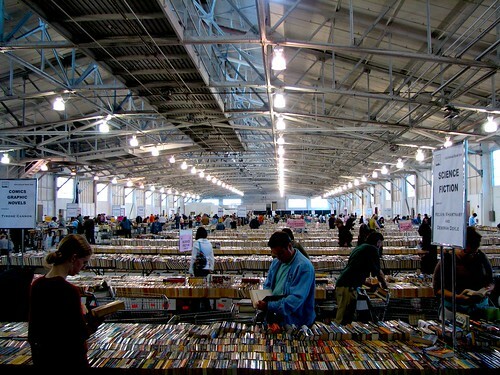 The Friends contend that it’s the largest book sale on the West Coast, and I’d believe it. It’s being held, as usual, at lovely Fort Mason, in the Festival Pavillion. Just go to Fort Mason — you can’t miss it! This sale is truly staggering, by the way. The picture above is of last year’s sale, and it nicely conveys the scope. (It comes from this great post on the anonymous blog, Tea & Cookies.) You could easily pick up a year’s reading for less than $50. Normally I’m such a restrained person in bookstores: because of the relatively high cost of new books, I almost never purchase one unless I’m certain I will benefit from it. Fifteen bucks per paperback adds up, never mind hardcovers! But at library book sales, all prudence goes out the window. Not only are the books cheap, but according to the Friends page, all the proceeds “fund education programs that promote literacy for children, teens and adults. Last year, over $250,000 was raised for San Francisco’s libraries.” How can you resist that? It’s a license to splurge. Last year my wife and I took public transportation specifically to limit the amount we could bring home, and we still ended up staggering up the big hill to our house with a huge bag stuffed with books. But it was worth it, I think. I’d be more certain of that if I could still remember what we bought. Join artist Lucas Murgida as he completes a three-year traveling art project which began here in the 826 front window. This installation of The Locksmithing Institute will kick off with a reception in the Pirate Store, where refreshments and a demonstration on opening doors without keys will be enjoyed by all. In February of 2005, The Locksmithing Institute conducted its first class at 826 Valencia. Here students were taught how to liberate themselves from their everyday shackles in a series of lock-picking courses. Since that time, the Institute has traveled all over the Western Hemisphere and has taught hundreds of students in Portland, New York, Oakland, San Francisco, Baltimore, Boston, and Uruguay a host of locksmithing skills such as how to pick locks, make keys, find keys, lose keys, and how not to pick locks. Click here for more details. On Friday, September 26, the eleventh and final lesson of The Locksmithing Institute will begin at 826 Valencia. Incoming students will be given the opportunity to test their meddle in the Institute’s mobile locking window display classroom. Tuition is free, all ages are welcome, no experience is necessary, and keys are not required. The event will run from 6-8 PM tomorrow night, Friday 26th. Unfortunately, I’m going to be down in Santa Cruz for most of the day, but I’m going to try really hard to be back in time for this! Former Giants All Star first baseman J.T. Snow — seen at left during 2005, his last season with the Giants — has signed a one-day contract with the team so he can retire as a Giant. Most recently, Snow has been a part-time broadcaster, part-time coach for the Giants, for whom he played from 1997 to 2005. A free agent in 2006, he signed with the Boston Red Sox but played little and announced his retirement during the 2006 winter meetings. Rumors that the Giants’ “major announcement regarding J.T. Snow” meant him being named as team manager, or anything else, proved false.